To continue with the vintage postcard theme from yesterday, this is another place that my family vacationed when I was young – Sarasota, Florida. In my opinion Sarasota and the surrounding keys (Longboat, Siesta, Lido etc) have some of the most beautiful beaches in Florida. Keep in mind this opinion is coming from an Ohio girl who’s Florida experience has been limited to Sarasota, Ft. Lauderdale (a late 70’s era spring break – was there a beach there?) and Orlando (not near the ocean). 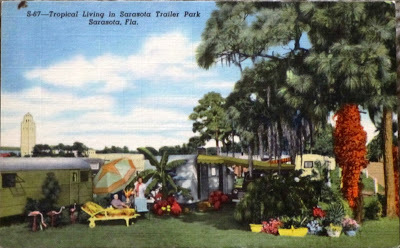 So now that I have told you how much I love the picturesque beaches of Sarasota, you are probably wondering why I would pick a trailer park postcard for my collection. Actually I had a good reason for picking this card. 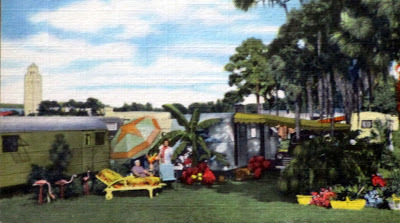 In the 1950’s my parents used to travel from our home town to Sarasota every year and they would be in Florida for the entire winter season. And they stayed in a trailer park. Now, I am not 100% sure it was this particular trailer park, but my Mom did remember the tower thing in the background. I believe it is the Sarasota County Courthouse, so if anyone knows for sure please correct me if I’ve identified it wrong. I love these old trailers. They had great lines. And look at the moss hanging from the trees. 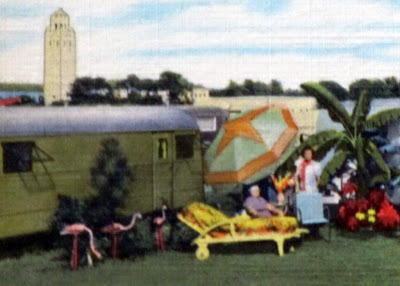 And what’s more vintage Floridian than sitting in front of your trailer on a lounge chair with artificial pink flamingos nearby and the wife leaning on a turquoise motel chair? Maybe sitting on the beach, but hey I think the trailer park is sort of kitschy. Did you know that Sarasota used to be the winter headquarters for the Ringling Brothers Circus? My mother and father knew some of the acts since they were living there at the same time of the year. Some of the sideshow acts I think. There is a Ringling Museum Of The Circus and Ringling Museum of Art in Sarasota and you can also tour the gigantically huge and very ornate Ringling home. There’s money in circuses I guess. 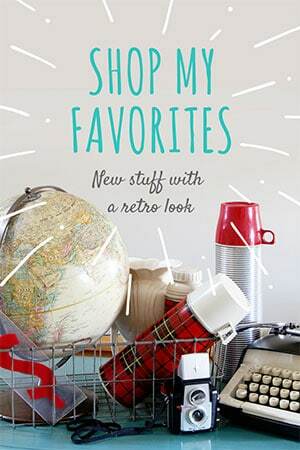 So there are many things to do in Sarasota besides lounging on the beach or at the trailer park. 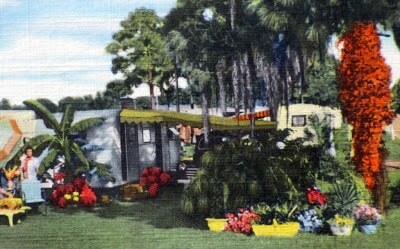 Tomorrow I will show you the third and last postcard in my family vacation collection. I know, you wish there were more, but alas I just have the three! 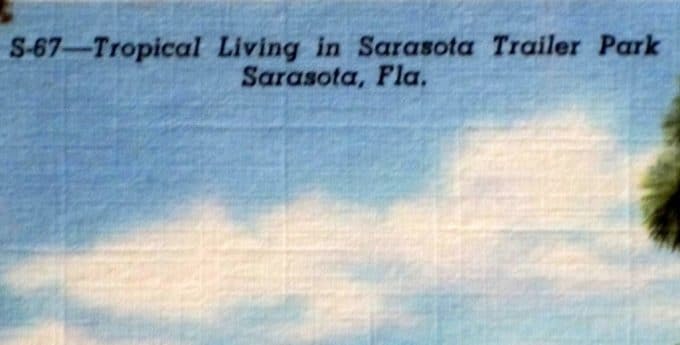 I spent many, many fine days in Sarasota when I was younger. I lived in Ft.Myers and Sarasota and Venice Beach were my favorite places to go. Venice Beach had a little place called the Venetian Inn and they served Belgian waffles with ice cream…something I had never had before that. Ringling Bros museum? Totally awesome..some wonderful art there. It makes me feel like I am 20 again to remember it. 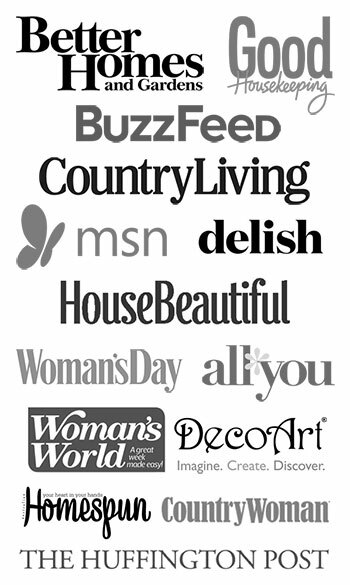 And, oh! Those pink flamingos. We have a family joke where we pass pink flamingos back and forth for Xmas presents and other holidays.